Malini Giridhar is Vice President, Business Development and Regulatory at Enbridge Gas Inc. based in Toronto, Ontario. Malini is accountable for business development and energy conservation, regulatory strategy and execution, as well as public affairs and stakeholder relations. 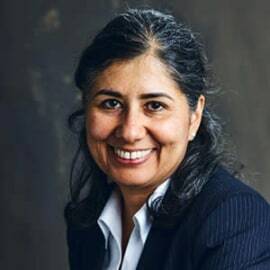 In previous roles, Malini led teams responsible for the regulatory approval of a major pipeline project in the GTA, gas supply and merchant storage and the development of natural gas rates and services for gas-fired generators. Malini is a Chartered Financial Analyst and has a graduate degree in Economics. In addition to her day to day work at Enbridge, she is very passionate about the promotion of diversity, inclusion and personal development. Malini is an active supporter of Pathways to Education and YouthLink, which are organisations that help at- risk youth graduate from high school.